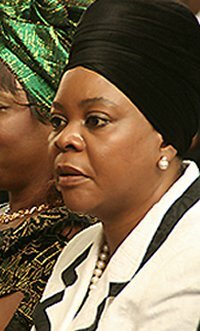 A Lusaka High Court has ordered former first lady Maureen Mwanawasa and five others to pay back over K1.2 million they received through a non-governmental organisation the Zambia National AIDS Network (ZNAN) for HIV/AIDS-related activities which they have failed to account for. This is in a matter in which ZNAN sued Mwanawasa and five others for failure to account for a K1.25 million grant given to the Maureen Mwanawasa Community Initiative (MMCI). The six are Mwanawasa, Noreen Mapala, Wright Mumeka, Sam Mundia, Simon Sakala and Rosario Fundanga who are all trustees for the non-governmental organisation (NGO) which was founded by Dr Mwanawasa in 2002. When the matter came up on Tuesday for the final judgment in default of defence before Lusaka High Court deputy registrar Charles Zulu, the court ordered the six to pay interest on all the sums due as well as costs of and incidental to the proceedings. In its statement of claim filed in the Lusaka High Court, ZNAN demanded that the six MMCI trustees pay back the K1.25 million they got from the organisation which they failed to account for. ZNAN further stated that the six trustees have declined to refund the money despite them having been served with several reminders as well as a letter of summons from the High Court. The organisation, through its lawyers, claimed that it has suffered loss and damage and further asked the court to grant it any relief that it may deem fit. ZNAN was a principal recipient of the grants administered on behalf of the Global Fund to fight AIDS, TB and malaria. It received about US$36.01 million and the MMCI applied to access part of the funds to use on people living with HIV and AIDS and to facilitate the development of life skills in young people to reduce their vulnerability to infection with HIV. Other programmes the funds were applied for are to facilitate voluntary counselling and testing (VCT), prevention of mother-to -child transmission as well as to support orphans and vulnerable people in societies, among other key programmes. But in 2010, the Global Fund Office of the Investigator General conducted an audit of MMCI in relation to the funds it received from ZNAN and discovered irregularities on the part of the NGO in that it mismanaged or misappropriated K1.25 million on unsupported expenditures. A report was issued by the Global Fund Office of the Investigator General in October 2010, in which it recommended the recovery of the funds. ZNAN stated in its statement of claim that the office of the Inspector General of Police was also engaged to investigate the matter but the MMCI failed to furnish the investigation team from the Zambia Police Service supporting documents for the purported expenditures of the money received from it.